Home » Wellness » Today I become 21- My Post Traumatic Growth (PTG) experience. 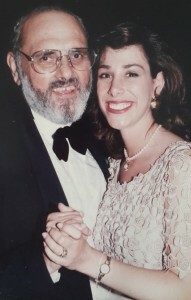 Today marks 21 years since my father Harry Bloom died. I was only 26 at the time, pretty young to lose the most influential person in my life. Turning 21 is seen as a time of reaching independence and maturity. Today, it would appear, and it feels like I have arrived at this landmark. So to mark this milestone in my life, I’d like to reflect on how much has changed, and how I have come to ‘earn’ my independence and maturity. Wikipedia describes Post-traumatic growth (PTG) like this: Positive psychological change experienced as a result of adversity and other challenges in order to rise to a higher level of functioning. My father was the greatest ‘cheerleader’ in my life. From a young girl he always believed in me and built in me the ability to believe in myself as well. He was a hard worker; left the house before I woke up in the mornings and often came home late. Despite this, he always made time for me, and when we were together he made me feel like I mattered, what I had to say was significant, and that I was important to him. One of the warmest feelings I remember is how proud he was of me and all my achievements. The more he felt proud of me, the more I wanted to make him proud, so this became the nature of our relationship. I thrived on his approval. He didn’t always approve of my decisions, and often I would change my plans just to please him. The result of this was always in my favor. The reward was love and approval. Before I went to university in the then Apartheid state of South Africa, he warned me not to get involved in politics on campus. At the time I wasn’t even curious about politics, and because of his warning, I didn’t even question if it interested me or not, he said no, so I listened. It was as simple as that. My father was a man of principles. He could afford to buy anything we wanted, yet he never fell into the trap of ‘keeping up with the Joneses’ or buying items because of peer pressure. To this end, we didn’t have labelled clothes because he didn’t see the purpose or difference in wearing a shirt with or without a crocodile on it. A shirt was a shirt. I believe that this has been one of his examples that has allowed me to grow up being true to myself, and being able to own my decisions and not feel pressured into what others are buying, where they are holidaying or what they have. What a gift. If I was interested in something my father wanted to hear all about it. And when I spoke, I always had the feeling that he was listening to me and was interested in me. One time after I had changed courses to study Interior Design, I wanted to learn in depth photography including bulk loading my own film. (Nothing was digital in 1991!) He bought me all the equipment and he bought himself a camera as well, and joined the course with me. At the time I remember feeling how he had just stepped into my world, not because he wanted to study photography, but because that is what I was interested in. It made me feel so loved and special. He would ask me to do errands for him or pay accounts and at the end he would say, “Keep the change Mammela.” I always loved that too. To this day, I love saying that to my daughters. It makes me feel like I am keeping him alive, passing on the warm, loving feelings. My father didn’t often say the words ‘I love you’ to me, but his feelings and actions towards me were beyond what those three words could express. I remember the day I got married. When he walked into the room and saw me in my wedding dress, he was overcome by tears, deep emotion and pride. You could see it on his face. My heart was bursting with the gift of this love, and this father. After I qualified my father continued with his cheer-leading. He helped me find a job with one of his endless contacts in the furniture design industry, and later after I had my first daughter he encouraged me to open my own space planning business closely monitoring and encouraging from the side. Even although I was married he would still take my car for a service and countless other chores. Just like that the carpet was pulled out from under my happy life! Panic and fear filled me as the doctors told us that there wasn’t much that they could do (or much hope) as it was so advanced. The day he was diagnosed I was 25 years old and just over 40 weeks pregnant with my second daughter. He was given 3 months to live and 14 months later he died. I was way too young to lose him. His illness and the knowledge of his impending death was agony for him. As a result of this, he couldn’t speak much about emotions. One day, I tearfully built up the courage and asked him if we could speak privately. Then the floodgates opened as I spilled my fears of a life without him and how much he meant to me. We both had a deep heart wrenching, but cleansing cry, sharing, thanking and loving each other. He told me how proud he was of me. What a special memory. After that I started to prepare myself for what I was so in denial of. Sitting with him on the couch that day taught me one of the most valuable lessons in my life. Don’t have regrets. On the one side of the scale, it was one of the hardest conversations I have ever had. On the other side, it was the most beneficial gift for both of us. None of us knows when someone is going to die. Imagine we don’t get the chance to say ‘I love you.’ To this day, I wear my emotions on my sleeve. I cannot live with regret, it’s easier to be vulnerable and share my emotions. During those 14 months my father was given a book by Dr Bernie Siegel called “Love, Medicine and Miracles.” I swallowed this book up as I read about becoming an active participant in one’s own healing journey. I was fascinated by the concepts and a passion for understanding what brings healing into our lives, and what healing really is, was slowly growing inside of me. This book led to dozens more as a whole new world was opening up for me. Little did I know at the time that through my father’s illness, I would eventually leave the design world to follow a new passion and deep purpose in my life of finding my own healing and helping others on their healing paths as well. Two days before he died he called each of his children (in age order) into the room for a last goodbye. It was so surreal, like something out of the Bible. I lay on the bed next to him hugging him and he told me how much he loved me and how much joy I had brought him in his life. I asked him to tell me again, and he did, and that was enough. I told him I would be OK, and that he could leave if he was ready. (At the time I was lying.) He also called Ian (my husband) into the room to say goodbye and to give him a blessing. For me, this was the most special feeling of acknowledgment and validation of their close relationship. It was as if he was handing the reigns of care over to Ian, and this made me feel safe, loved and protected. Maybe I would be OK.
On 10th November 1997 at 5am my father died. In the hours after he died, shock and disbelief overtook me. I was gripped with grief and felt as if my throat was being strangled by immense loss. I remember watching the hearse leave the house with him inside and running after it screaming ‘daddy’. I couldn’t breathe. Life giving air could not enter my airways, and I felt like I was being chocked with emotional pain. In this moment my friend Fiona gave me the homeopathic remedy Ignatia, which is specifically indicated in moments of intense grief. I had never heard of Homeopathy before that day. In an instant I felt that choking hand release from my throat and the air filling my lungs. It was a powerful moment. Looking back, it was the continuation of my interest in healing as another new door had just opened up for me. Ironic that it happened the day my father died. The funeral was surreal and I watched the whole event from a place outside my body above my right shoulder. To this day I don’t have the words to describe it. The following day, I met Linda at Shiva who became a close, nurturing and caring friend until this day. Our paths probably wouldn’t have crossed had she not come to the house. There was a gaping hole in me that was starting to fill. The initial months were devastating. I was so lost without my father. I had to become a grown up overnight and inside I still felt like ‘daddy’s little girl’ and was so desperate to continue to be his ‘Mammela’. As the months passed, I realized that I didn’t know who I was. I didn’t know who I was because I had always focused my life on making my father proud and doing what would make him happy. I didn’t even know if I would have chosen the car he chose (and bought) for me. I was drowning in confusion and loss. Now he was gone, I had to painfully discover what I liked to do, what interested me and most of all, what would make me feel proud of myself. I was like a caterpillar rebelling about weaving a cocoon. But change was on its way, and the metamorphosis would prove to be worth it. One day, in the first year, I was driving and listening to a tape (remember those!) by Rebbetzin Heller. She was speaking about relationships. She was saying that we enjoy being with certain people because they bring out something in us that we like about ourselves. Similarly, we don’t enjoy being with some people because they bring out something in us that we don’t like about ourselves. Like a mirror-effect. Then it was as if she was speaking directly to me when she said, “Imagine your father has just died, and you were very close with him. Not only have you lost your father, but that which he brought out in you that you liked about yourself, will never be brought out in you again. So not only have you lost your father, you have lost a piece of yourself, which you need to mourn as well.” I remember pulling up on the side of the road and uncontrollable sobbing. Sobbing for the grief I was feeling without my dad, and now sobbing for that part of me that had died too. The funny thing is, before I heard this, I didn’t know it had happened. Afterwards, both of these parts of me started to heal. As I had mentioned the seeds of becoming a healer had been planted in me while my father was sick. I lapped up books on healing as I searched to find myself and heal, and I also wanted to help others heal as well. It felt like a calling was growing in me. One of the books I came across was from Dr John Demartini. This is what he discussed: Nothing has ever happened, or can happen to you that is not a gift and a blessing. It’s difficult to be thankful until you find the hidden benefit in what may seem at first to be a negative event. Everything that happens is a vital part of the Divine order. Even the most terrible events always contain hidden blessings. How could this possibly be true? How could there be ‘good’ or ‘hidden blessings’ in losing my father? I realized that I was on this path of self-discovery, not because I had chosen to go down that path, but because I was drowning without an identity after my dad died. The more I went down this path, the more I learned about myself. And, I liked what I was learning. I had a strength and determination in me to succeed, find my purpose, and live it, not because I wanted to make my dad proud, but because I wanted to be proud of myself. The butterfly was starting to emerge. The funny thing is that along the way, I knew beyond a shadow of a doubt that this self-transformation was making him proud anyway, even if he was not physically here. Eventually I couldn’t deny the calling, and went to study Reflexology, making a 180 degree career change. I wanted to help people heal, but not just their bodies, I wanted to help them HEAL on a soul level. The learning hasn’t stopped in these 21 years. I have moved on to study Bereavement Counseling, Mental imagery for healing and Logotherapy, the teachings of Dr Victor Frankl whose famous book ‘Man’s search for Meaning’ has inspired me to help not just myself and my family through trying times like making Aliyah, but to help others navigate their way through their own challenges. What a privilege! Going back to Dr Bernie Siegel, whose profound words 22 years ago grabbed me when he described healing as this: There is a difference between being healed and being cured in life. We are all going to die in the end. The greatest of humankind die, like Moses, Mother Theresa and Mandela. This is not what we are trying to avoid. Being cured is often not in our hands, but being ‘healed’ is available to all of us, even if we are going to die. These words made a huge impression on me, to live life, each individual day with purpose and meaning, is to be healed. So, I’ve turned 21. It wasn’t a choice of mine. It was what Hashem put in my path. My father ‘stepping out’ of my life has allowed me to mature and grow into the person I am today. I believe in the truth of the quote from James Allen, “Circumstances don’t make a man, they reveal him.” When I look back at these past 21 years of self-discovery and introspective growth, I painfully realize that my father leaving my life was actually the greatest gift he could have given me, to step back and allow me to discover who I am and continually to grow and develop into everything he knew that I could be, and more.